In routine health care, clear communication improves the effectiveness of diagnosis and treatment, leading to quicker and more effective recovery. By providing communication support, Widgit Health aims to improve the inclusion of, and outcomes for, patients, especially those who have a communication need. Widgit has over 30 years of experience in the field of supporting communication and making accessible information. 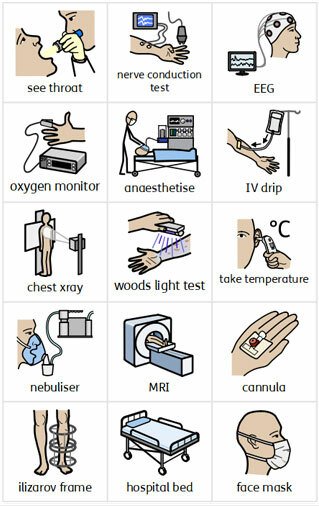 Translated into 17 languages, the Widgit Symbols are used in education, social and health care worldwide. Widgit Health products and symbols have been designed in partnership with healthcare professionals to meet the communication needs of service users. Through an on-going research and development process of collaborative work, Widgit is constantly adding to the products and resources available. Widgit are able to licence and design symbols for use in third-party products. We are also interested in establishing development partnerships to create new solutions for healthcare communication. Please contact us to discuss licensing or partnership options.